Swim Lessons at SJI Fitness! Island Rec is excited to offer another installment of Swim Lessons at SJI Fitness! 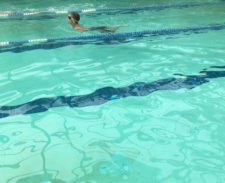 The fun starts with a Mid-Winter Break Swimming Beginner Skills Class (Ages 5+) 3:30-4 pm February 18 through the 22nd. We also have classes for varying skills and ages that start February 25 such as Swimming Pre-K Water Play (Ages 4-5), Swimming Intermediate (Ages 7+), Swimming Parent and Child (Ages 6mo-3yrs), and Swimming Float School (Ages 7-12). For more information on class dates, times, or registration visit www.islandrec.org; call 360-378-4953 or drop by the office at 580 Guard St. Monday – Friday 11am-5pm.